It's difficult to properly install hardwood flooring without professional assistance - but not impossible. It is certainly not a project for beginners, but if you have experience with other DIY home improvement projects, you might be up to the task. We strongly recommend you follow the National Wood Flooring Association Installation Guidelines for hardwood flooring, and don't hesitate to call a professional if you are unfamiliar or uncomfortable with any part of the installation process. That being said, we have five helpful tips you should definitely know before beginning any hardwood flooring installation project. This is by no means a complete installation plan, but a few things to keep in mind during the process. Enjoy, and good luck! 1. Adjust your home's humidity. Hardwood flooring reacts negatively to poorly regulated indoor climates. This is especially true for solid hardwood flooring materials. It's important to make sure the humidity levels in your home are at an appropriate level and are regulated year round. Drastic changes in temperature and humidity can cause your wood floors to bend, buckle, and warp. Properly acclimating your hardwood flooring materials to their environment is one of the most important parts of the installation process. You should use moisture testing equipment to determine when your boards have reached acceptable ranges of moisture content. These levels vary depending on your geographical region and your subflooring. Acclimation times vary, but plan on waiting 2 - 3 weeks before you can start installation. Installing hardwood over shoddy subfloor can ruin your floors almost immediately. Make sure your floor is flat, smooth, structurally sound, and has the right moisture levels. Not sure how to determine this? Call a professional. Many manufacturers have very strict parameters when it comes to warranty claims. The best way to save yourself the headache of having to make a claim is to inspect every board before installing it. Returning a product because you don't like the look or because it has some sort of manufacturer defect is a lot easier if the material has not been installed yet. Many homeowners equate DIY projects with brute strength, when in reality this is rarely true. When it comes to installing hardwood floors, it's better to have a softer touch. You don't want to force planks together or pound a board with a hammer -- this type of behavior can lead to dents, scrapes, and otherwise damaged boards. Remember, DIY hardwood flooring installation isn't for everyone. To learn more, talk with one of our hardwood flooring specialists. Despite being around for a long time now, engineered hardwood flooring is still quite misunderstood. Some people think it is the same as solid hardwood flooring, while others liken it to laminate flooring. In fact, the truth is somewhere between the two comparisons. Engineered flooring is made up entirely of wood - there are no synthetic elements to the material. However, engineered flooring is made up of many layers of different types of wood. The top layer gives the specific variety its namesake - for instance, African Walnut engineered flooring may have layers of different wood throughout the board, but the top layer is solid African Walnut. Because engineered flooring is made of many layers and not one solid board, it is more resistant to weather and environmental conditions. It is specifically designed to reduce moisture problems common with solid hardwood flooring. This design reduces bending, buckling, warping, and other moisture-related problems. Unlike solid hardwood, engineered flooring can be installed in nearly any room or floor of your house. It is appropriate for first floor, second floor, or even basement applications. It also is easier to install than solid hardwood. Many varieties don't require stapling - you can either glue the boards down or lock them into place and float the floor over an existing one. As you might imagine, engineered hardwood flooring is less expensive than many varieties of solid hardwood. This allows homeowners to get the look and feel of traditional solid wood floors at a fraction of the cost. When you scratch or dent a solid hardwood board, in most cases it is relatively easy to sand out the blemish and refinish the board. This isn't true with engineered flooring. Because the top layer is only so thick, if you sand it away you will be left with the exposed layers beneath it. Most bad dents or scrapes require the board to be replaced. This isn't always a difficult project, but it can take longer and cost more money than refinishing. The benefits of engineered flooring really only apply to high-quality products. Like any manufactured product, if the product is shoddily made it won't last long. Some inferior engineered flooring products have very poor veneers or finishes that can contribute to the boards' warping or fading. Likewise, if the interior layer isn't made of high-quality wood the boards can lose dimensional stability. If you choose engineered hardwood flooring made with high-quality materials, the pros will far outweigh the cons. Visit the Wood Monsters website to learn more about engineered flooring and view our selection of products. Welcome back to our new blog series, Wood Monsters Featured Items! As we're sure you well remember, the last installment of the series took a look at solid prefinished African Walnut. This week we're going in a complete different direction and shining our spotlight on Brazil: Smooth Engineered Brazilian Cherry, that is! The Brazilian Cherry hardwood flooring from Wood Monsters has a nearly uniform reddish color, a medium to coarse texture, and subtle tree growth markings nicely blended into the wood. Also known as Jatoba, Brazilian Cherry is one of the most popular hardwood flooring materials imported into the US every year. The light black striping and subtle tonal differences give Brazilian Cherry flooring a lot of depth and contrast. Our Brazilian Cherry has a classic, sophisticated look perfect for dining rooms, entrance ways, and any other room you'd like to make an impression. 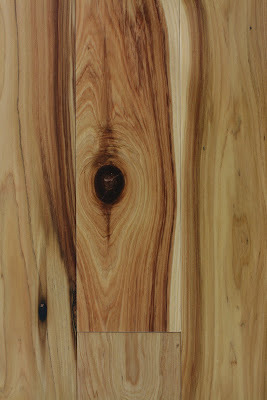 In addition to its beauty, Brazilian Cherry is a very durable hardwood. Like most exotic hardwood flooring materials, Brazilian Cherry has high Janka hardness and density ratings. Its density and hardness make it a great choice for high-traffic areas of your home or office. It is also naturally resistant to wood rot and boring insects. If you're looking for an attractive, versatile building material that will last for generations, look no further than Brazilian Cherry hardwood flooring. Wood Monsters has an assortment of different sizes of Brazilian Cherry flooring. Chat with our live flooring specialist to learn more about the features and price of this great exotic flooring species.